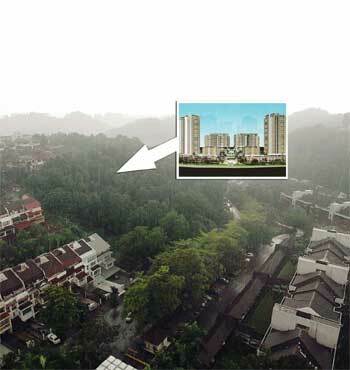 KUALA LUMPUR: In a move which would surely cause dismay among residents in Bukit Bandaraya, Bangsar, mayor Datuk Ahmad Fuad Ismail said yesterday that the development order for another controversial project — a highrise luxury condominium in Jalan Medang Serai — had been approved. He said the approval was given in August last year. “We have checked and found that the development order and earthwork plans were approved last year. However, we have engaged our consultant Ikram to look into the project,” he said when asked about the status of the project. Fuad said that Ikram would be presenting their preliminary report to City Hall in November. “We will have a look at the report. Then maybe, we may ask the developer to reduce the area of the development,” he said. The proposed project on a plot of land near the Tivoli Villas apartment and facing a row of townhouses, would comprise eight blocks of luxury apartments totalling 212 units. The blocks will be 6, 11 and 28 storeys high and will have three and five-storey multi-level carparks for the apartments’ residents. Initially the project would have increased the density capacity of this area by 500 per cent from 30 people per acre to 175 people per acre. However, Fuad said that the density had been reduced to 157 people per acre. The announcement was greeted with shock and disappointment by the Bukit Bandaraya Residents Association and also the Jalan Medang Serai action committee. Both parties were aghast that they were not informed about the approval of the development order. “We are very disapppointed,” said Bukit Bandaraya Residents Association vice-president Mumtaz Ali. “We were told that everything hinged on the outcome of the Kuala Lumpur Draft Plan 2020 and that no development plans would be approved until then. “We expected more transparency and City Hall should have called or written to us to inform us of its decision and the reasons for it, just as they did when they asked us to attend the public hearing on the project. Mumtaz said the association would be writing to City Hall to voice its disappointment and seek an explanation for the decision to approve the development order without waiting for the approval of the KL Draft Plan 2020.